One of the earliest professional rock critics, Robert Christgau is known for his terse reviews, published from 1969 to 2013 in his Consumer Guide columns. He also spent 37 years as music editor for The Village Voice, during which time he created the annual Pazz & Jop poll. 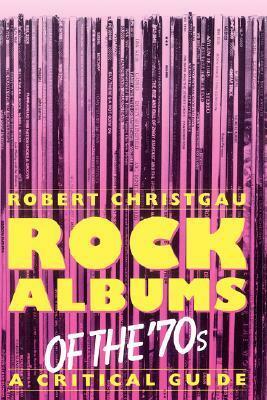 His book, “Christgau’s Record Guide: Rock Albums of the Seventies” was published in 1981 and contains a multitude of his brief and often sarcastic reviews of 70’s era albums. Robert Christgau has adapted his notorious Village Voice column to produce the essential guide to recent rock and roll. It is the first book devoted to the years that brought us disco, punk, and new wave; that established Linda Ronstadt, Bruce Springsteen, Neil Young, Bob Marley, and Deborah Harry as superstars; and that confirmed the brilliance of Bob Dylan, John Lennon, Stevie Wonder, and the Rolling Stones. The man who has listened to more rock and roll than anyone else in the country offers a unique reference book, as energetic and rebellious as the music he has the nerve to grade–funny and personal, but always searching for musical, literary, and political standards in an amorphous and hype-ridden business.